Slowpoke Well is an online database designed for me to store and share my own personal Pokémon collections! While I focus mainly on SLOWPOKE, I have a couple of smaller collections to share as well. Even though my collection isn't the biggest around by any stretch of the imagination, I do take some pride in what I've put together throughout the years. I only hope that I can give some information to future collectors who share the same interests! The name Slowpoke Well was taken from the Gold and Silver Pokémon GameBoy games released in 2000. Known as ヤドンのいど / Yadon no ido (lit. 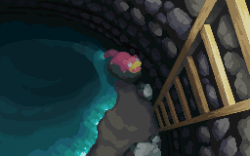 Slowpoke Well) in Japan, the well sat outside of Azalea Town-- a town where the local people treat the Slowpoke with great respect, as it is said that the Slowpoke saved the town from a great drought 400 years before you arrive in the game. Please feel free to take a look around, and thanks for stopping by! SLOWPOKEWELL was created and is maintained by lazer. Opened June of 2010.